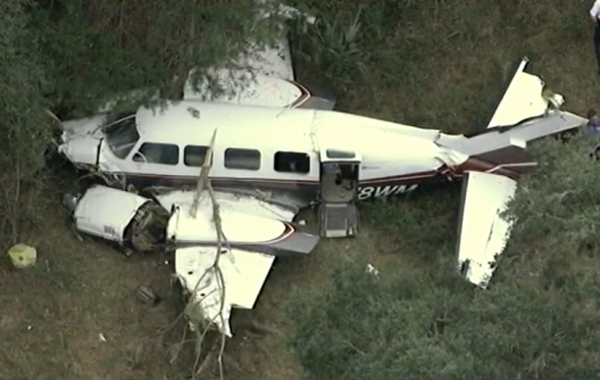 On December 24, 2012, about 1435 eastern standard time, a Piper PA-31-350, N78WM, was substantially damaged when it collided with terrain during a forced landing following a loss of power in both engines near Leesburg, Florida. The private pilot was fatally injured and the pilot-rated passenger was seriously injured. Visual meteorological conditions prevailed, and no flight plan was filed for the flight, which departed Eagles Nest Aerodrome (FD44), Crescent City, Florida, at 1405, and was destined for Leesburg International Airport (LEE), Leesburg, Florida. The personal flight was conducted under the provisions of Title 14 Code of Federal Regulations Part 91. According to the pilot-rated passenger, who was also the pilot's wife, the pilot completed the preflight inspection of the airplane and prepared for their departure while she was shopping. Upon returning home, she boarded the airplane, secured the aft cabin door, and prepared the cabin for departure as she would normally do prior to any other flight. She then sat down in the front right seat of the airplane about the time the pilot had taxied onto the runway. Shortly after takeoff, and while reading through the after takeoff checklist, she noticed that the fuel quantity in the left and right fuel tanks appeared to be low, with the left gauge reading slightly above 1/4-tank of fuel and the right gauge reading slightly below 1/4 tank of fuel. When the passenger queried the pilot about the fuel quantities, the pilot replied that the left fuel gauge always indicated a greater quantity of fuel than the right gauge, and that if the fuel quantity in the right tank became too low, they could always use fuel from the left fuel tank. She continued to closely monitor the fuel quantity state and fuel flow to both engines for the next 10 minutes. About that time, and about 6 miles north of LEE, the right engine began to surge. The pilot responded by repositioning the right engine's fuel selector from the inboard to the outboard fuel tank. He then contacted the air traffic control tower at LEE, requested to land, and advised the controller that the airplane was running low on fuel. Shortly after making that transmission, the left engine began to surge, and the pilot again responded by repositioning the fuel selector from the inboard to the outboard fuel tank. The pilot then began searching for an off-airport landing site, and during the descent both engines operated intermittently. The pilot later advised air traffic control that the airplane was "going down," prepared for a forced landing to a field below, and extended the airplane's landing gear. 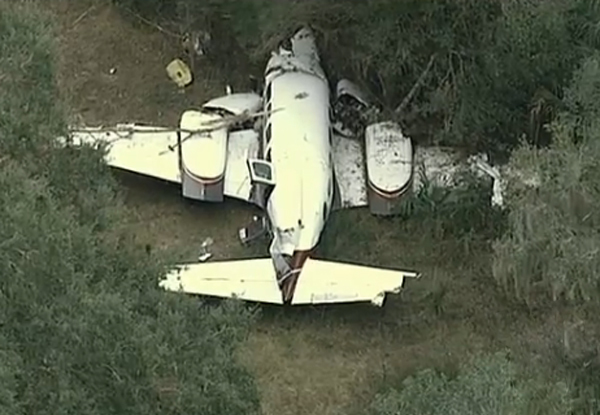 The airplane subsequently struck trees short of the pilot's intended landing area. Double engine failure due to fuel exhaustion.